In Shanghai, me and Hanna lived close to one of the real hot spots for expats: Yongkang Lu. People mostly went there for the numerous bars. To eat, barhop and have a good time. This however didn’t sit well with the locals (living on the second floors along the street) who regularly started throwing things from their homes down to the street when the clock past 10PM – the official curfew. Things deteriorated further I guess, as Chinese authorities closed the street shortly after we moved back to Sweden. Anyway, we didn’t go there much for the drinking but we did frequent a café called Pain Chaud. A surprisingly wonderful French café, though everyone weren’t aware of that. One of the first time we went there the Chinese waitress serving us asked what “Pain Chaud” meant and which language it was 🙂 A french café yes, yet unabashedly Chinese. Most importantly, they made great cakes and best of the bunch was this lemon/ meringue tart. I’ve tried to recreate it and I think I’ve done a decent job. 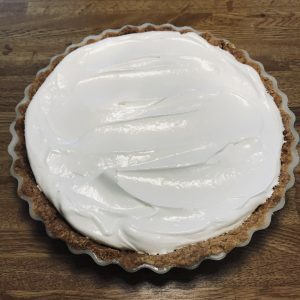 I’ve pieced it together from a version of the filling in Greg’s tangy lemon tart, a less sweet variant of this simple pie dough, and this Leif Mannerström Italian meringue recipe. The result is different from the thing we had, but very good. Put the oven on 180 C.
Melt the butter and mix it with the dry ingredients. Spread the dough evenly in a pie tin. Prick the bottom of the dough with a fork. 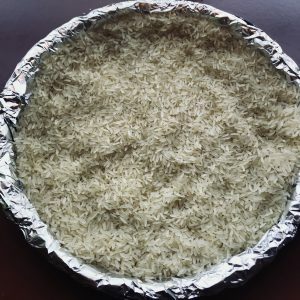 Coat the dough with aluminium foil, then fill it with (in order of preference) coins, rice, or beans. 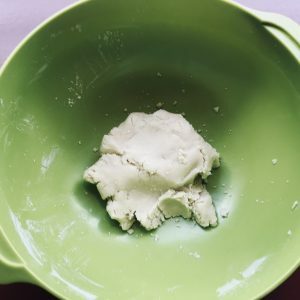 The purpose of this is to keep the dough from collapsing and generally keep its shape. Bake the dough for ca 15 minutes then take it out of the oven, remove the coins/rice/beans and the aluminium foil. Continue baking in the oven until golden, then let it rest. 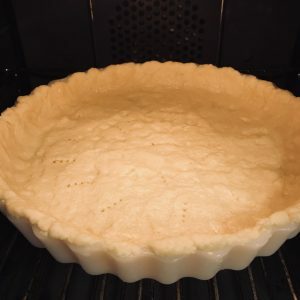 While the pie crust is baking, prepare the filling. Grate two of the three lemons (should result in ca 30-40 ml peel). Squeeze out the juice from all three lemons (should be 100-150 g/ 1-1.5 dl). Crack the eggs and mix them with the sugar. 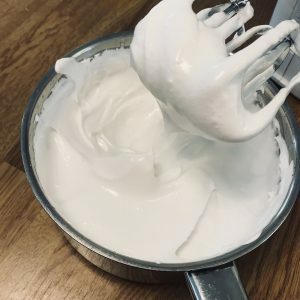 Whisk until reasonably smooth. Add the cream, the lemon juice and the grated lemon peel. 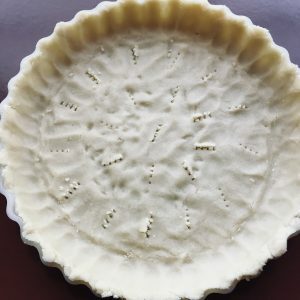 Pour the filling into the (baked) pie crust. Bake in the oven on 130 C. It should be finished in about 30 minutes but depending on the shape of the pie tin (and the oven) the time can vary quite a lot. 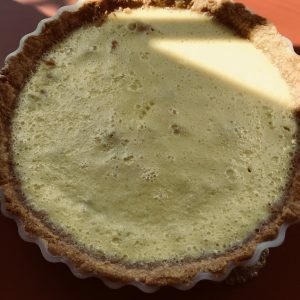 The lemon filling should be just set. If overcooked it becomes a bit to eggy. Let it cool for a bit outside the oven. And now for the Italian meringue. 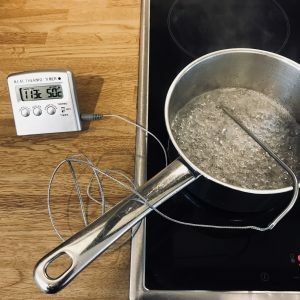 Mix 110 grams of the sugar with the water in a pot and bring it to 125 C. Let it cool to ca 115 degrees. Add the egg white, the lemon juice and the last 10 grams of sugar to the sugar solution whilst mixing with the electric mixer on the highest (most intense) setting for about three minutes. 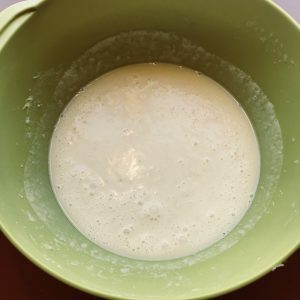 It’s very important that you’re mixing while you’re adding the egg white, otherwise you’ll get a very sweet omelette instead.Continue mixing on a slightly less intense setting until the meringue is fluffy and firm (ca 5 minutes). 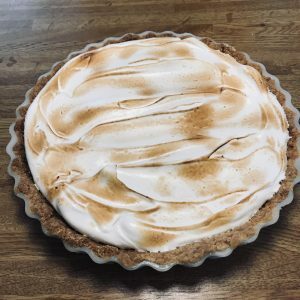 Spread the meringue across the surface of the pie. 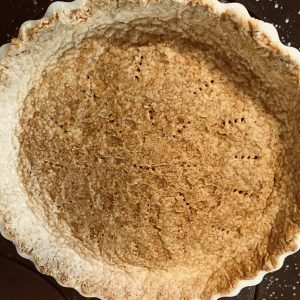 I just love love love this pie but it does require a bit of practice. I’ve made several ones that I haven’t been quite pleased with. 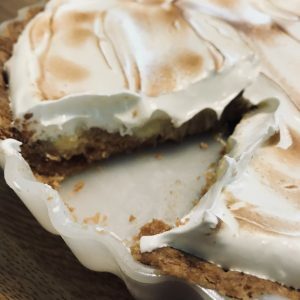 The lemon filling is really so much better if the time in the oven is timed perfectly and the meringue can be a little bit tricky. Easily worth it to put in the time though.